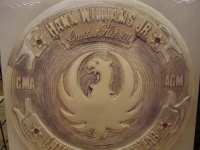 "Hank Williams Jr., Greatest Hits Vol.3"
Factory Sealed Classic Analog LP Pressing. The nicest thing you can do for your stylus and ears. The way music was meant to be heard. Out of Print forever! Small cut out on the cover. Tracks Include: "I'm for Love" "This Ain't Dallas" "Ain't Misbehavin'" "Country State of Mind" "Mind Your Own Business" "My Name Is Bocephus [Live]" "Born to Boogie" "Young Country" "Heaven Can't Be Found" "Finders Are Keepers" "There's a Tear in My Beer."